Today is National Hug a Plumber Day, but before you embrace yours, let's have a laugh. From fixing a busted toilet or a broken pipe, most plumbers try their best to repair all sorts of things typical homeowners and renters don't want to mess with. So it's no wonder that when they delve into the deeply buried waste disposal systems and water supply lines, they encounter some odd things. The following stories are according to technicians employed by Mr. Rooter, an international plumbing and drain cleaning franchise. Warning: Some of the following images may be disturbing to some readers. When one North Carolina technician went to unclog a commode, they didn't expect to see the start of Jurassic Park. They found the source of the clog, but this particular dinosaur may face extinction after where it's been. 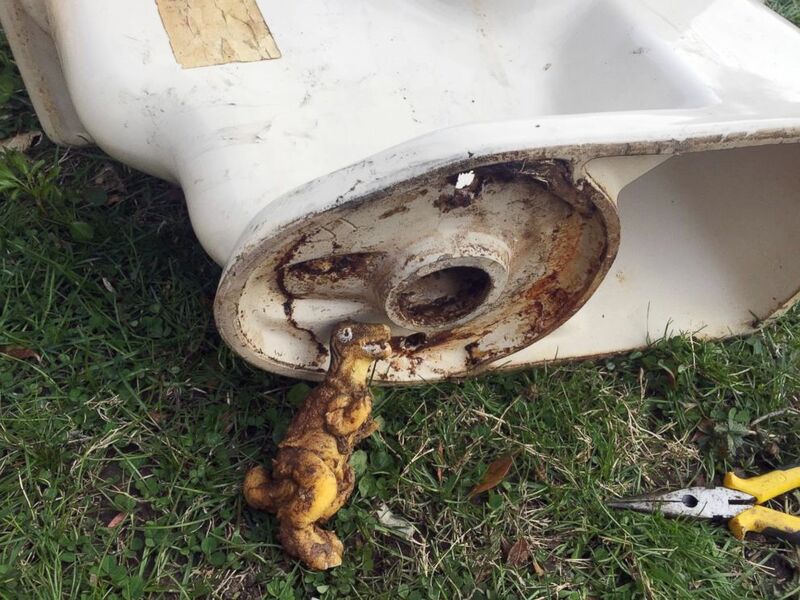 A plumber pulled this toy dinosaur from a commode in North Carolina. Jewelry often falls down the toilet at the most inconvenient time. Many people lose their class rings, and even their wedding rings. 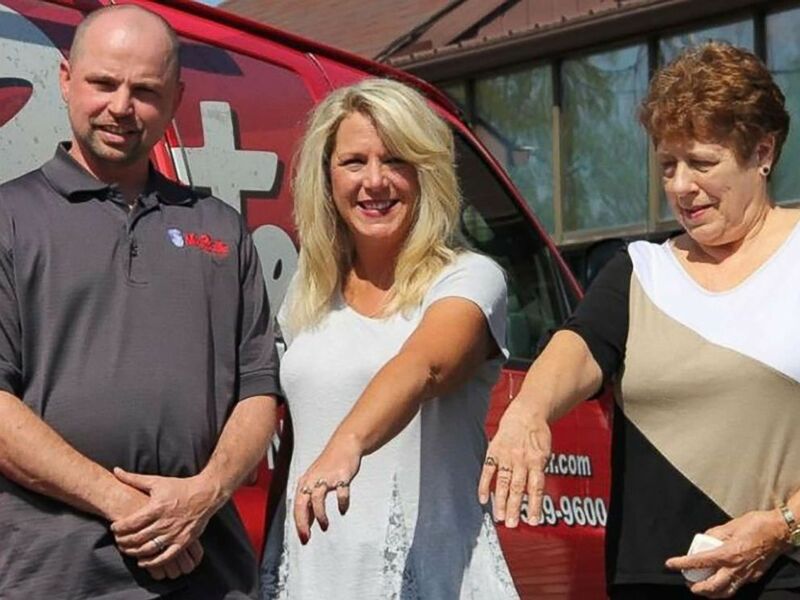 While working, an Ohio plumber found four class rings dating back to 1969. After discovering these, they researched who could be the owners and were able to contact the ring's owners and reunite them with their lost pieces of high school nostalgia. A plumber in Ohio discovered these class rings over the course of several years. Speaking of jewelry, one Columbus, Ohio, technician was working on a customer's sewer line when the noticed something shiny fall out. 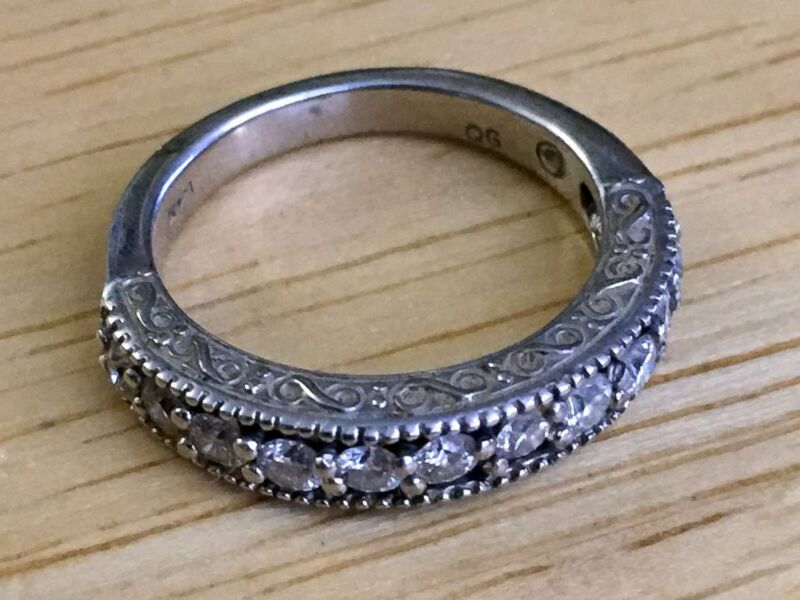 This diamond ring, which belonged to the customer's daughter, was presumed lost when she placed it on the side of the sink nearly 10 years ago. The custom-made wedding band was a gift from a family member, so the ring's owner was glad to be reunited with the trinket. An Ohio plumber made a woman's dreams come true when he discovered her long-lost wedding band. This is a story you can really sink your teeth into. A California customer once called to complain about a stoppage in his toilet. While looking through the pipes, the technician pulled out both upper and lower dentures. "Oh that's where they went," the customer reportedly exclaimed. According to the technician, the customer had gotten sick the night before after drinking. 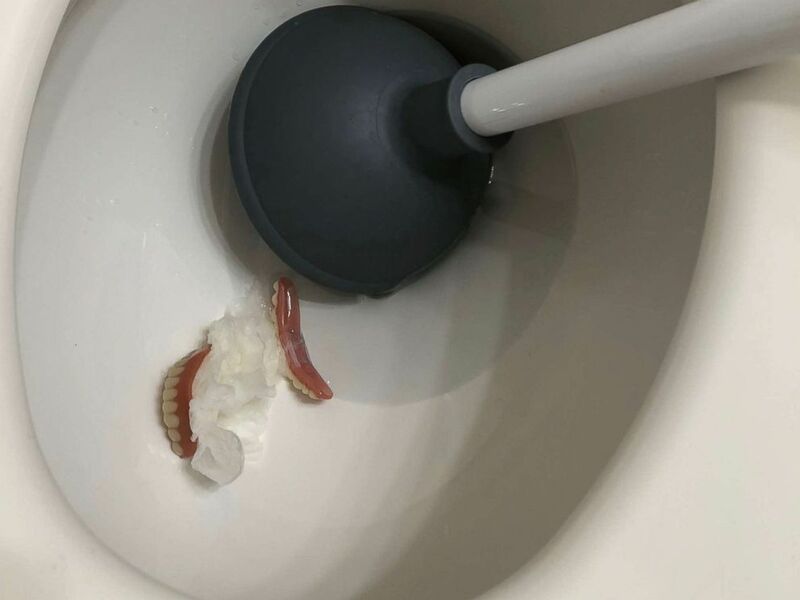 A California plumber was surprised when these dentures showed up in a clogged toilet. 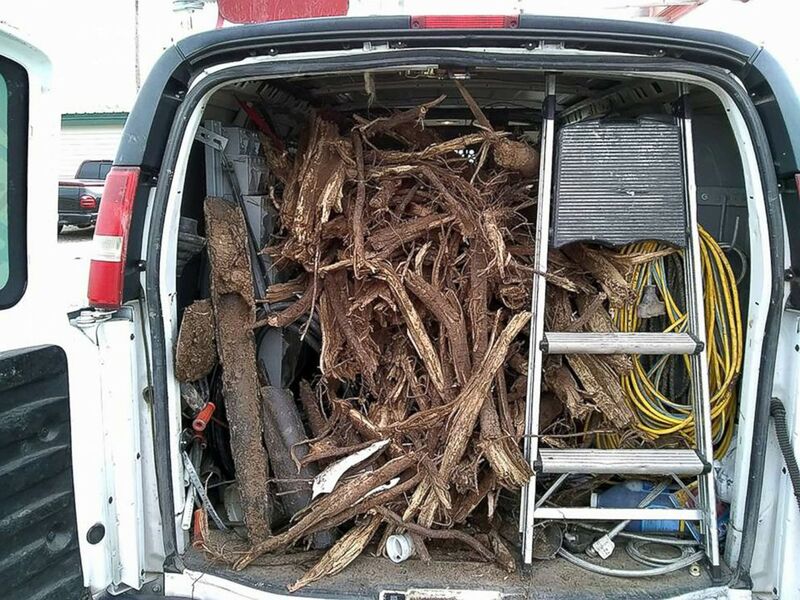 Here was a job Brandy Waugh, co-owner of Mr. Rooter Plumbing of Amarillo, Texas, described as "a nightmare on many levels." While repairing a customer's line, the technician discovered the tap was not located where the city claimed, but was, instead, under a neighbor's backyard. They had to dig up the neighbor's yard, where they encountered a wild collection of roots. A Texas plumber had to dig up a person's backyard in order to complete their customer's needed repairs. Steady your stomach, as this story is a bit hairy. 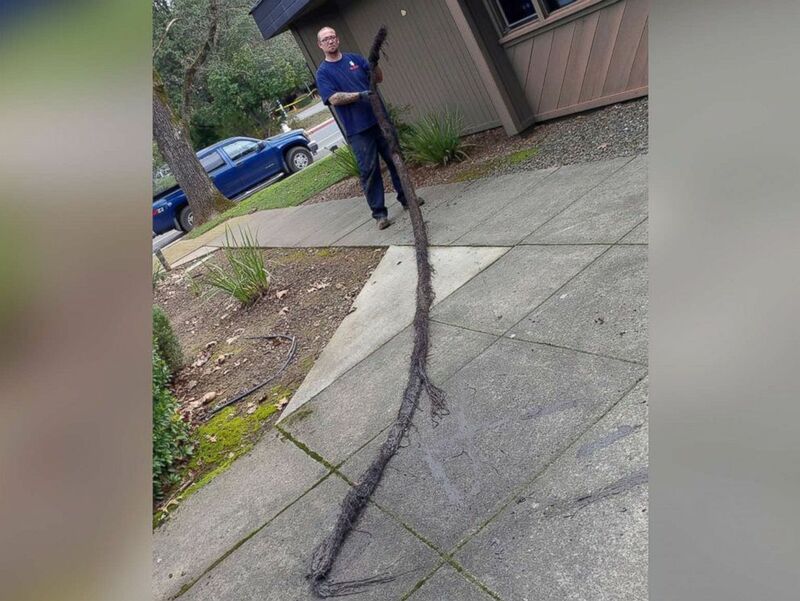 This plumber in Spokane, Washington, pulled out this 12-foot-long mass from a storm drainage pipe. It was the largest the company had ever seen. 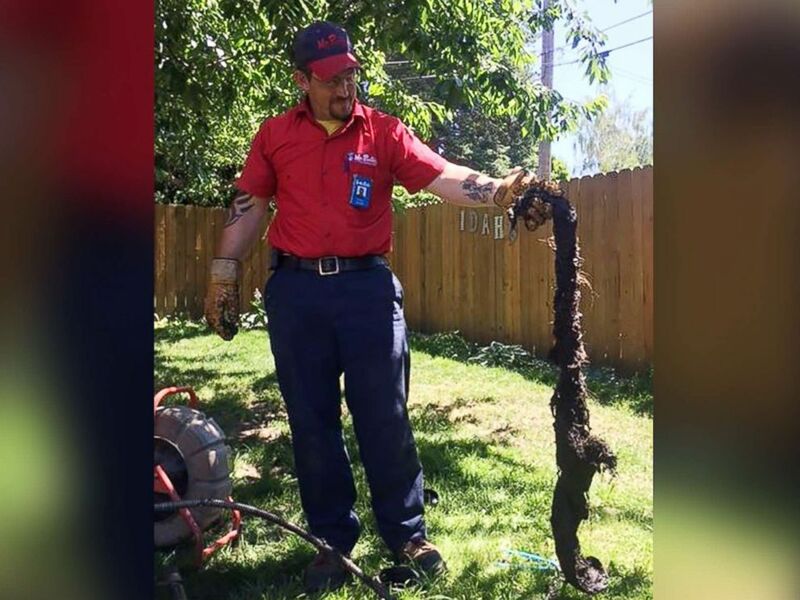 This 12-foot-long mass was found clogging a drain in Spokane, Wash.
Then, the next day, another nearby technician removed a mass half the length, but extremely thick. This extremely thick mass was discovered in a drain in Washington state. So find a plumber this April 25 and give him or her a pat on the back. It's a dirty job sometimes, but someone's gotta do it.